My Father, Maker of the Trees is a story not only of surviving the Rwandan genocide--it is also a story of spiritual rebirth, healing, and redemption of a land and a people. This incredible true account shows readers the reality of evil in the world as well as the power of hope. Eric's message of God's relentless love through our darkest circumstances will encourage and inspire. Now available in trade paper. 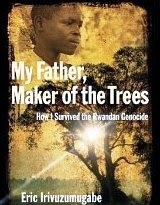 Publishers Weekly: The author was 16 in 1994 when he fled for his life as Hutus set out to eradicate Tutsis in Rwanda. Those 100 days of genocide left more than one million people dead and also left 120,000 orphans. Irivuzumugabe survived by hiding for 15 days in a cypress tree, watching from above as Hutu killers combed the brush, killing anyone they found. He wondered about the fate of his family; he wondered if he would survive the lack of food and water. Fifteen years later, the author shares his story—and the stories of other survivors—with American readers. “I want you to know of my struggle so that you too may feel the call to forgive,” says the young man who in 2005 founded Humura Ministries to help fellow orphans in Rwanda. This story mirrors many told by those who came through Rwanda's genocide, yet the power of this book comes from a call to forgiveness worldwide as well as from the author's understanding of suffering. Americans can only benefit from this story of God's provision and grace. I was a little hesitant to read a story about the genocide, not wanting to hear the details of the murder of so many people in Rwanda, but this book was well worth the read. It covers Eric's story of watching so many of his friends and family murdered, and how he spent days hiding in the trees to escape death himself. His story of survival is a miracle in itself, but what happens afterward is a true testament to the power of God to change lives and bring hope. Eric takes this horrific experience and moves beyond it to live a life that inspires and encourages others. I especially love the story of Joie, to see how God laid the burden of the Rwanda people on the heart of this American woman and brought her together with Eric to support his efforts to love and care for the people of Rwanda. This book left me with hope and a renewed amazement of the power of God to bring good out of the most horrible of events.